SAUK RAPIDS, Minn. - June 15, 2016 - Shane Stewart proved to be like a rock Wednesday night at Granite City Speedway as he battled past Kerry Madsen and held off Brad Sweet to win his fourth World of Outlaws Craftsman® Sprint Car Series feature of the season. Kerry Madsen led the first third of the feature with Stewart in hot pursuit. As Madsen encountered traffic, Stewart closed the gap in his No. 2 Eneos/GoPro car. On lap 10, Stewart dove low into turn three and got around Madsen. Madsen countered, taking the spot back, sliding Stewart through turns one and two. Stewart though made a similar move as the previous lap and took the position back through turns three and four. Through one restart, Stewart held the position and scored the win. 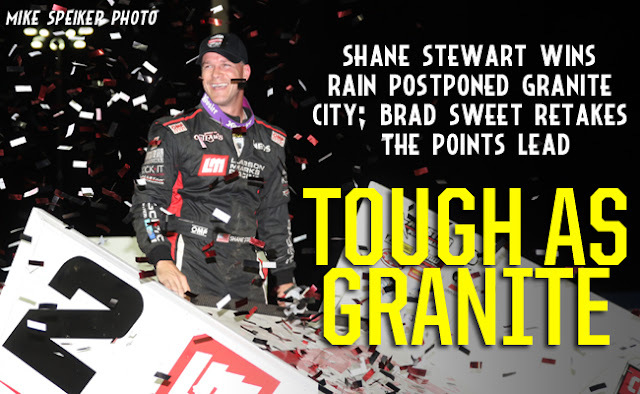 It was a triumphant trip to victory lane following a difficult weekend at Knoxville Raceway and the knowledge that last season, he was leading at Granite City with three laps to go and did not see a similar end. "I was actually getting really nervous," Stewart said. "The guys gave me a really great car. Obviously being out front, you're kind of a sitting duck. I felt like I was getting through lapped traffic OK, but you never can tell with the guys behind you. I know Brad is really good in lapped traffic and so is Kerry. I just had to keep my nose clean and be as patient as possible." Second-place finisher Sweet claimed a narrow one-point lead in the championship points standings over Donny Schatz who had a did-not-finish result. Schatz had a mechanical issue on lap 13 and slowed on the track. Greg Wilson was caught up and had his night ended after his car ended up on its side, wedged against an infield tire. Schatz was pushed to the infield after dropping oil on the track and did not return. Joey Saldana kicked off the night, the Outlaws' second ever event at Granite City Speedway, by claiming a season-leading ninth quick time award with a lap of 11.227 seconds. After winning the dash, Madsen started on the pole of the feature with Stewart in second. At the green flag, Madsen jumped out to an early lead as Brad Sweet powered forward in his No. 49 Ollie's Bargain Outlet car, using the high line through turns three and four to take the third position. Madsen caught the tail end of the field and began working his way forward. Stewart closed the gap over the next five laps and battled around Madsen. As Stewart took over the lead, Sweet got around Madsen on the next lap for second. Following the red flag for Schatz and Wilson, Sweet tried to get around Stewart as he threw a slider through turns one and two and pulled event with the leader, but was unable to hang on to the back straight. Sweet tried again on the next lap, but Stewart again maintained the position. Stewart caught the tail end of the field on lap 18 and Sweet briefly closed the gap but he was not able to get around. The win was Stewart's first since Lawrenceburg Speedway on May 30. "I just know when you're leading these races you can't hesitate on lapped cars because you're going to get passed," Stewart said. "I've been able to do that a couple of other times to win a race and I felt like if I could get back to curb as quickly as I could and scrub off as little speed as I could that I'd be OK… to win these races is very hard and I'm just happy to be standing here." Sweet said he felt like he and Stewart were on par throughout the night but lapped cars played a pivotal role and Stewart was able to clear them successfully throughout the 30 laps. "He did a really good job of just always keeping his car in the right position," Sweet said. "A couple of times I thought he was going to slip up there off of four and he went low and I thought I would get a run high and a lapped car slid up in front of me. Lapped traffic just didn't play in our part but that's how you win and lose these races." Madsen, who led the first 10 laps of the feature in his No. 29 Keneric Healthcare car, said he felt like he was making the right moves but realized that he could have played them differently. "On the last red and we had a short run afoot, I got by Brad and I thought I might have something to play with but Shane had a better racecar and probably deserved to win the race," Madsen said. "We had a bit of bad luck last weekend. We've had great racecars the last two months and we're excited for the next two months… I think we'll be here a bit more often." The World of Outlaws Craftsman Sprint Car Series continues its swing through the Upper Midwest with a stop of River Cities Speedway in Grand Forks, N.D. on Friday, June 17. For more information and to learn how to purchase tickets, visit WoOSprint.com/River-Cities-Speedway-June. RACE NOTES: Brad Sweet took over the points lead following a DNF for Donny Schatz during the feature. Sweet now leads Schatz by one points… Tonight's win was the fourth for Shane Stewart this season. His last win came at Lawrenceburg Speedway on May 30… Joey Saldana scored a season-leading ninth quick time tonight at Granite City Speedway… Logan Schuchart was the night's KSE Racing Hard Charger, advancing seven positions to finish in seventh. CONTINGENCY WINNERS - MSD Ignitions ($25 cash): Greg Wilson; MSD Ignitions ($50 cash): Shane Stewart; Penske Shocks ($50 cash): Paul McMahan; JE Pistons ($50 cash): Jason Johnson; VP Racing Fuels ($50 cash): Jacob Allen; Edelbrock ($50 cash): Jason Sides; Comp Cams ($50 cash): Joey Saldana; Morton Buildings ($50 cash): Ian Madsen; Cometic Gasket ($50 cash): Paul McMahan; Super Flow ($50 cash): Paul McMahan; Craftsman/Sears ($100 cash): Kerry Madsen; KSE Racing Products ($100 product certificate): Logan Schuchart; Comp Cams ($50 product certificate): Shane Stewart; JE Pistons (Set of Rings): Clyde Knipp; JE Pistons (Set of Rings): Rob Caho. SEASON WINNERS: Donny Schatz - 9 (Volusia Speedway Park on Feb. 14, The Dirt Track at Las Vegas on March 4, Stockton Dirt Track on March 18, Stockton Dirt Track on March 19, Silver Dollar Speedway on April 2, Lincoln Speedway on May 19, Weedsport Speedway on May 22, Lincoln Park Speedway on June 8, Knoxville Raceway on June 11); Brad Sweet - 6 (Volusia Speedway Park on Feb. 13, Volusia Speedway Park on Feb. 14, Cotton Bowl Speedway on Feb. 26, Ocean Speedway on April 1, Bakersfield Speedway on April 15, Plymouth Speedway on May 13); Daryn Pittman - 4 (Royal Purple Raceway on Feb. 27, Perris Auto Speedway on April 16, USA Raceway on April 18, New Egypt Speedway on May 24); Shane Stewart - 4 (Arizona Speedway on March 6, Devil's Bowl Speedway on April 23, Lawrenceburg Speedway on May 30, Granite City Speedway on June 15); David Gravel - 3 (Thunderbowl Raceway on March 12, Tri-State Speedway on May 14, I-96 Speedway on June 6); Joey Saldana - 3 (The Dirt Track at Las Vegas on March 3, Devil's Bowl Speedway on April 22, Jacksonville Speedway on May 4); Kerry Madsen - 2 (Eldora Speedway on May 6 and 7);Lance Dewease - 1 (Williams Grove Speedway on May 20); Chad Kemenah - 1 (Fremont Speedway on June 3);Jason Johnson - 1 (Placerville Speedway on March 24); Terry McCarl - 1 (Knoxville Raceway on June 10); Jason Sides - 1 (I-30 Speedway on April 26); Greg Wilson - 1 (The Dirt Track at Charlotte on May 27). World of Outlaws Craftsman® Sprint Car Series Statistical Report; Granite City Speedway; Sauk Rapids, Minn.; June 15, 2016.